The weather’s getting cooler, so by Grub Street’s calculations that means it’s time for our drinks to get stronger. Lucky us, New York’s bartenders have the city covered. Whatever your poison — cognac, gin, whiskey, brandy, or something more esoteric — there’s a super-boozy drink just waiting to warm you. Who needs a fireplace? “Bonded” refers to whiskey that has been aged and bottled, for at least four years and bottled at 100-proof (50 percent alcohol, in other words). In this case, it may also refer to the fact that you’ll need to bond yourself to your chair to keep from falling off, as Scott Fitzgerald’s version of the Vieux Carre uses both Rittenhouse rye (100-proof) and Laird’s apple brandy (100-proof). Instead of vermouth he substitutes the 60-proof Luxardo Amaro, upping the ABV as well as spicy notes. Jim Meehan has romanticized the decidedly less-than-romantic in this homage to Laird’s distillery in Scobeville, New Jersey, by naming a cocktail after the chaotic transportation hub that’ll get you there. But there may be more to the name: After knocking back a couple of this stirred medley, featuring flavorful 100-proof Laird’s Bonded apple brandy, yellow Chartreuse, and earthy Noval Black Port, your brain may be doing some transporting of its own. Just steer clear of operating any buses. This Greenpoint bar recently refocused the cocktail menu to be to be a bit more “stirred and boozy,” with their Plaza Vieja the booziest of the lot. A version of the New Orleans Vieux Carre, they’ve replaced the brandy with the zippy Banks 7 Island gold rum, and added Rittenhouse 100-proof rye, sweet vermouth, and Peychaud’s and Angostura bitters. Amaro CioCaro and an orange peel round the whole thing out. Michael Neff is featuring the traditional thirties drink — invented at the Monteleone Hotel in New Orleans — on Ward III’s “classics menu,” pairing 100-proof Knob Creek rye with 106-proof Louis Royer Force 53 VSOP cognac, to match it in both flavor and strength. The overproof Louis Royer Force 53 is also the base for Tim Cooper’s Carribbean-esque Bouquet cocktail, and recently won the cognac’s “Show Me the Proof” cocktail competition’s Grand Prize. How’d he win over the judges? By tempering the spirit with Lustau Oloroso sherry, velvet falernum, lemon juice, and maple syrup, shaken and garnished with pear slices. A creation of co-owner and bar manager Dan Greenbaum, who adapted the cocktail from a 1927 Cuban book called El Arte de Hacer un Cocktail y Algo Mas, the Fox Shot features 114-proof Navy-strength gin (so named because if it was spilled and mixed with gunpowder aboard a ship, the powder would still ignite), Brandy de Jerez, sweet vermouth, and bitters to balance out the heat of the gin. Booze at the Shanty comes straight from the source: the New York Distilling Company that’s right next door. That includes the Perry’s Tot Navy Strength Gin (57 percent ABV), named for Matthew Calbraith Perry, who served as commandant of the Brooklyn Navy Yard from 1841-43. In this recipe, Katie Stipe complements it with lillet blanc vermouth, the gentian-flavored Aveze liqueur, yellow Chartreuse, and orange bitters, for a cocktail that could take down even the sturdiest Navy man. We’d like to imagine that this drink — made with New York Distilling Company’s Dorothy Parker gin, Cocci sweet vermouth, and Fernet Branca, and served in the spot formerly occupied by Bill’s Gay Nineties — is named by mixologist Ben Scorah for what’ll happen after you chug a few. We’re gonna keep on thinking that. Served at all of Dale Talde’s spots, this take on the Negroni substitutes 100-proof Rittenhouse Rye for gin, stirred with the rich Carpano Antico vermouth, and Campari. This one comes with a lesson in history. You can guess it’s named for Al Capone, but did you know he lived part of his life in Park Slope, where all three bars that serve the drink are located? 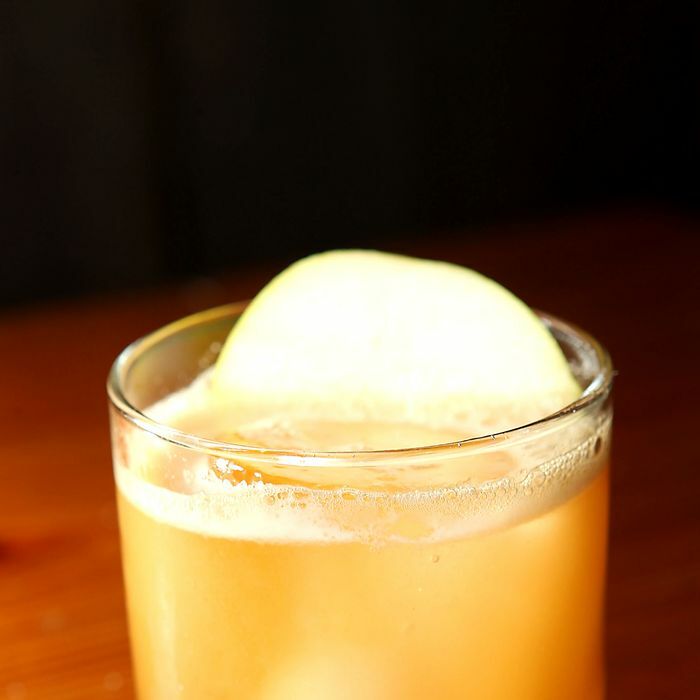 Johnny Swet has tailored a drink for masochists, or party animals, as the case may be, with his nod to the movie Eyes Wide Shut, and a lesson in what will happen after you drink his concoction of 86-proof Herradura tequila, Patron XO, which contains both tequila and caffeine, and Cointreau. Good luck getting to sleep after that. Head to Cienfuegos for one of the best takes on the aptly named “Zombie,” a concoction that they limit to one per person for reasons you can probably figure out. Absinthe and Maraschino are mixed with Angostura and a rum combo of El Dorado 151, Appleton VX, El Dorado three-year and Barbancourt four-year. Don’t let the mint sprig and fruit skewer fool you: This one is no joke.